Mystery still surrounds Sir William Asthorpe who with his wife, Lady Margaret (née Dynham), obtained the licence to crenellate Hemyock Castle. Records show that Sir William was appointed to the important post of "Keeper of the Channel Islands" at an especially sensitive time – in 1373 during the interminable "Hundred Years War" with France which lasted from 1337 to 1453. These islands located close to the coast of France and in the western approaches to the English Channel had great strategic importance. In the 10th Century they had been granted to the Dukes of Normandy, brought to UK by William the Conqueror. In return for maintaining the defences of the Channel Islands, Sir William Asthorpe was appointed the virtual ruler and awarded all taxes and revenues. Interestingly, the Commitment also specifies that, in the event of peace, a farm of 300 marks per year be paid to the King&apos;s exchequer. During Sir William&apos;s time, the French made several major raids. 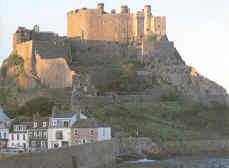 In 1373, Bertrand du Guesclin, Constable of France, (also called "The Sword of France") and Duc du Bourbon led a large force which overran Jersey, captured Grosnez Castle and besieged Mont Orgueil (then known as Gurri or Gorey Castle). After much valiant fighting on both sides, the French finally managed to undermine and breach the outer wall. The English forces retreated into the massive castle keep built on the solid rock of the promontory. There was stalemate. Due to the solid rock, the French could not undermine the keep and were losing men to hunger and disease. They were also highly vulnerable to attack by the English fleet. Finally, Sir William agreed terms with du Guesclin: If English fleet did not arrive in time, Sir William would surrender the castle in two months, at Michaelmas (ie. 29th September 1373). In the meantime, the French would withdraw. The English fleet did arrive so the castle was saved. Several defenders were knighted for their valour. By coincidence, du Guesclin was from near Dinan – like Sir William&apos;s wife&apos;s family! The French raided again in 1374 and 1375 until the islanders agreed to pay them a ransom to stop hostilities. Presumably Sir William used the first-hand knowledge gained during this time and during his earlier service in France to help plan Hemyock Castle. In 1600, while Sir Walter Raleigh was Governor of Jersey with its new Elizabeth Castle, he resisted pressure to demolish the now dilapidated and obsolescent Mont Orgueil Castle. However, Sir Walter was not so lucky. He later fell from favour and was sentenced to death, by Lord Chief Justice Sir John Popham – the owner of Hemyock Castle! Writ de intendendo to the jurats, consuls, stewards, reeves, officers and other ministers and lieges of the islands of Jereseye, Gernereye, Serk and Aureneye, in favour of William de Austhorp and John Cok, appointed by Walter Huwet, to whom the king has committed the keeping of the said islands and the islands adjacent from 2 April next, and who is staying in Brittany about the expedition of certain of the king&apos;s affairs, to be his lieutenants during his absence, as the king&apos;s yeomen, Thomas Cheyne, general attorney of the said Walter, has testified before the king. as the king has learned for certain that Walter Huwet, to whom keeping of the said islands, and of the king&apos;s castles and fortresses there, was committed for life on 25 July, 40 Edward III, refuses to support the costs and charges of such keeping in this present time of war, or to stay personally on the safe-keeping of the islands, castles and fortresses, and purposes to go to other parts, whereupon the king by advice of the council has caused the islands etc. to be taken into his hand, and has committed them to William in order to avoid the perils which might arise by hostile attacks.